It’s in my blood, an old soul courses through my veins: a deep yearning to keep the past. The mission- to salvage and redo all that is shabby and worn. Repurpose and restore the tattered, the scrapped, and elevate the flawed. This pull to find imperfect beauty is an inescapable ache to preserve and cherish. It is a process that begins with a discerning eye, a glance once cast, smitten. A wish to envision the possibilities of recovery, the wish to polish and show prettiness, grips hold of me. With love, the chosen object of desire gains stature and presence, beholden to my unwavering vision and gentle touch. It is part curiosity that draws me back in time, allowing my imagination to grab hold of another reality, the past. Closing my eyes, I envision the row house on Adelaide Terrace. The blackened front door holds an iron knocker fashioned in the likeness of a lion. I stand on the brick stairs mustering up the courage to knock. From an adjoining window, a broken heart plays the sad notes of a piano. His fingers linger on keys, softness builds to crescendo. Will she answer? The woman hears the soft knock upon the wooden door. She wonders who comes to call? Carefully, she sets the gilded china tea cup onto the table. The roses give her reason to pause and remember. I recall the woman who lives in the Adelaide Terrace home. Prim comes to mind as I envision her presence. Pin curled hair, bobbed and chin length, fashioned off-center by the snag of a single bobbie pin. Her tucked in blouse is the creamiest of silk. Always she centers a pearl studded pin under the collar, an heirloom treasure from her deceased mother. A blue wool skirt graces her petite frame, hemmed below the knees. Her cheeks are lightly rouged and her lips rarely smile; she is never amused. Yet, once upon a time the woman ran carefree through the blooming gardens, hid among the greenest hedgerows; her long auburn hair flying with the wind, green eyes twinkling from the laughter that spilled from a precious place deep within her Irish soul. The woman learned at an early age, objects of beauty never last long. The bloom fades, the fragile china surface gathers cracks that graze and shatter. This woman was my grandmother; she learned that real fades, becomes tarnished over time. She forgot, we endure because we remember. The stories told come back to mind, moments coveted to memory, snugged tight within our hearts. They won’t let go, never want to leave. We knew love in all its glory and all of its tattered pieces. I open the box that houses her mismatched china. Carefully I set the cups and saucers upon the floor. One piece enchants. 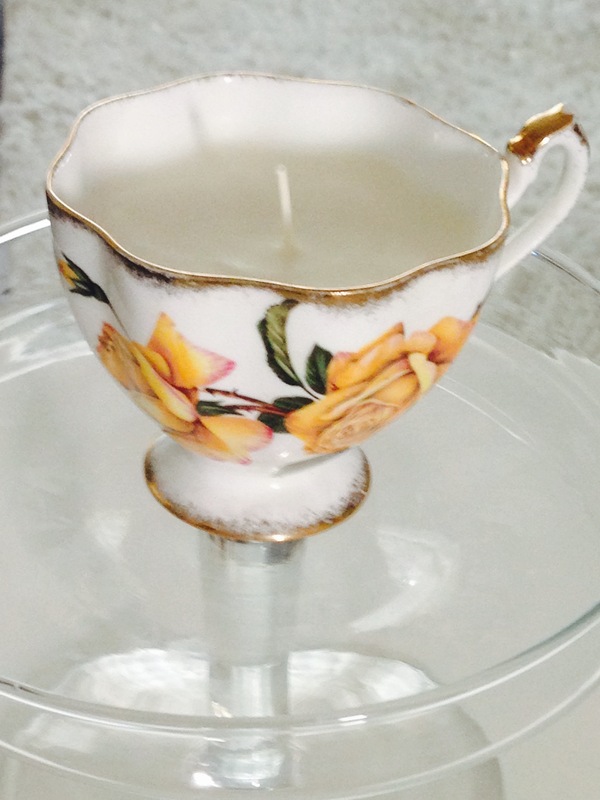 It is the cup with the faded tea roses, the gilded edges faded from time’s kiss. This is the one I keep. Thank you, A Passionate Dreamer. I’m glad you liked it. OMG! I could be that grandmother (with my small collection of mismatched china). I think I even have this very cup! I just went to look at it, but I think mine has a few more roses on it. Mine is a Royal Albert and is called Tea Rose. Very similar to your photo. Maybe it is the same and the rest of the roses are obscured because of the angle of your photo. Is this one called “Tea Rose”? There is a single bud on the opposite side of the tea cup. It’s a pretty one, quite vintage in appearance. I must state, it’s a favourite of mine. Somewhere I have the “cousin,” a splashy array of red roses adorn that one. Beautiful teacups! Mementos of days long past. This is beautiful. I love old things too. It’s nice that you carry on the tradition. Thank you for your kind words, atimetoshare. I am drawn to certain vintage items especially floral pieces of china and barkcloth. I believe it may have a bit to do with fond memories of “tea time.” My great aunt always paused for tea as did my grandmother. It was a simple ritual. During tea time, seated at the kitchen table, we had our “best” chats. I’m glad that you enjoyed this piece. PS~ A talented friend of mine just sewed a pennant style “banner” made from barkcloth and vintage tablecloths. I will “post” a pic as it is truly inspirational. Beautifully told Lynne. I have my grandmother’s tea service and one that my mother got for her wedding in a china cabinet in our living room. Thank you for your kind words. My grandmother had a few pieces of Royal Winton that I coveted as a child and now “treasure” as an adult.